New contemporary designed holiday home with huge bi-folding doors from living areas and bedrooms that open to magnificent yet intimate uninterrrupted 180 degree panoramic beach front and sea views. Air conditioning/heat pump units in the two bedrooms and open plan living area. Gas and electric cooking and instant hotwater gas heating. Under floor heating in bathroom. Seperate two bedroom studio and bathroom with breakfast bar available for extra per person charge (See conditions below). Parking for boat on property by studio and seperate outside fish cleaning facilities. Three minutes walk to beachfront - golden sandy beaches. Safe swimming and water skiing for children. Fantastic fishing, boating and diving. Launch boat from beach or near by Amodeo Bay boat ramp. 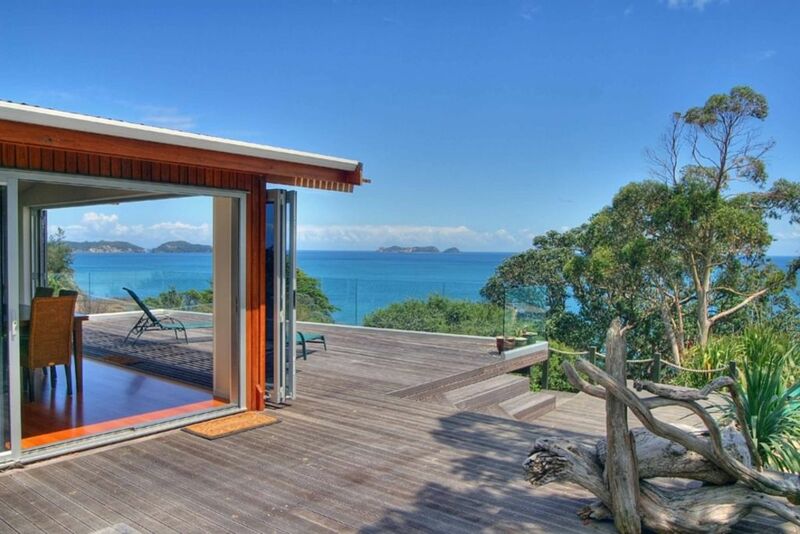 Escape to a quiet, peaceful bay with a wide variety of native bird life - ideal for a family or romantic getaway - relax on the private glass edged deck and enjoy the stunning views of the sea, coast line, island vista and sunsets. Great location for discovering the wide array of attractions that the peninsula offers. 20 minutes drive to Coromandel town for restaurants and boutique craft shops. Bring your own "Linen" - sheets, pillow cases and towels, however duvets and pillows are supplied. Guests to leave the bach tidy as found, a cleaning fee is required, see below. Not suitable for children under 4 years as there are internal stairs. THE BASE RATE QUOTED IS FOR RENTING OUT THE BACH WHICH HAS TWO BEDROOMS AND BATHROOM FOR UP TO 4 GUESTS. TO RENT THE STUDIO WITH TWO BEDROOMS AND BATHROOM FOR UP TO AN ADDITIONAL 4 GUESTS, THERE IS AN EXTRA CHARGE OF $30.00 PER NIGHT PER GUEST. PRIORITY IS GIVEN TO COMBINED RENTALS. MAXIMUM OF 4 GUESTS BACH AND 4 GUESTS STUDIO. EXTRA GUESTS STRICTLY BY NEGOTIATION ONLY. Two nights minimum stay however Jan school holiday bookings will be only accepted for 7 days minimum stay. Air Conditioners in the Beach House. 2 in bedrooms and 1 in living room. Instant heating with Heat Pumps in Beach House. Oil heaters in Studio. Room to park your boat on the flat area by the Studio. Plenty of off road parking for cars. We absolutely loved this house and the seclusion offered. The house was very well appointed with amazing glass doors that really open up to bring the outside in. The kids also loved wandering the pathways and swimming at the private little beaches (with resident rays and snapper). We had our parents with us as well who enjoyed having their own space in the granny flat that still had it's own spectacular views. A very pleasant holiday was had by everyone. Was a spectacular location, gorgeous beaches and well appointed house. Had a wonderful time with the family hope to return someday. I’m allergic to bees, in the future I will remember to bring my EpiPen as there are a lot of bees in this location! We loved staying here, such a perfect location, house and view!!! Beautiful home, stunning location for magical ocean vistas from amazing deck area, every comfort you would need, well equipped kitchen for all the cooks in our family, well stocked pantry which we dipped into and topped up before we left, beautiful tomatoes from the garden. We are a family of 7, grandparents, daughters, son-in-law and grandchildren, so the extra studio space was excellent. A very loved home, we felt privileged to be here. Two weeks of bliss, we loved it!